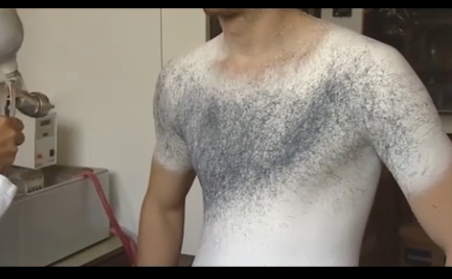 Spray On The T-Shirt Of Your Liking. Clothes in liquid form? When I was studying different fabrics at F.I.T my teacher never told me about this. Must of been because he didn’t know about Spanish designer Manel Torres. 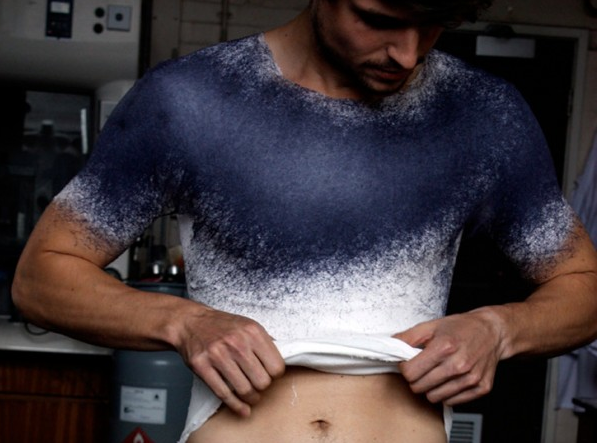 While other designers were working on creating new types of t-shirts like the burnout or laser-cut, Torres went a step further by teaming up with scientists from The Imperial College in London, to invent a liquid solution which consists of short fibers mixed into a solvent, allowing it to be sprayed from a can or high-pressure spray gun. With fifteen minutes to spare, and a pair of goggles, you can spray design your very own garment! The texture of the fabric can be varied by using wool, linen or acrylic fibers. I know you’re wondering how much is this gonna cost? It is expected to cost $15 for a can and should be available for purchase next year. Not too bad for something we will be able to spray on, wear, wash and wash again! One downside to this would be how cold the fabric is when it meets the skin. So I wouldn’t hold my breathe for spray-on trousers and other garments for certain regions of the body, coming out anytime soon. More info on The Guardian. Tell Me My Creative Friends. Amy Martino Can You Draw Me?